For those who farm or ranch in the Northern Great Plains, drought is a fact of life. 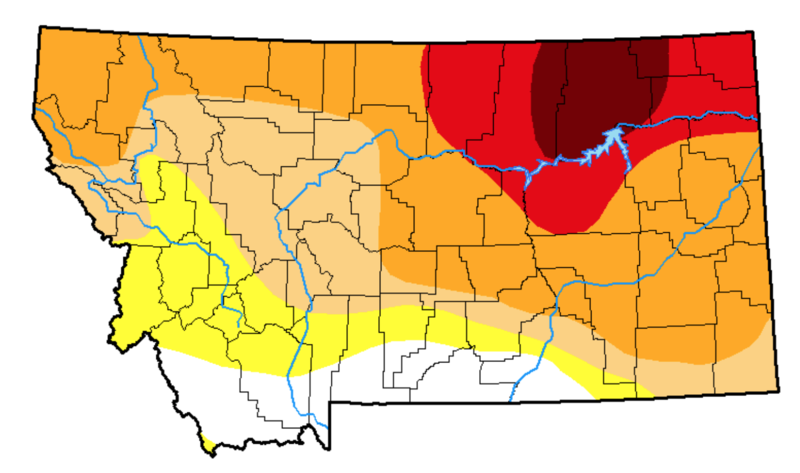 While past posts have talked specifically about the current drought (see here), this post will attempt to place the current drought within context of past droughts in Montana and provide some strategies for dealing with drought. 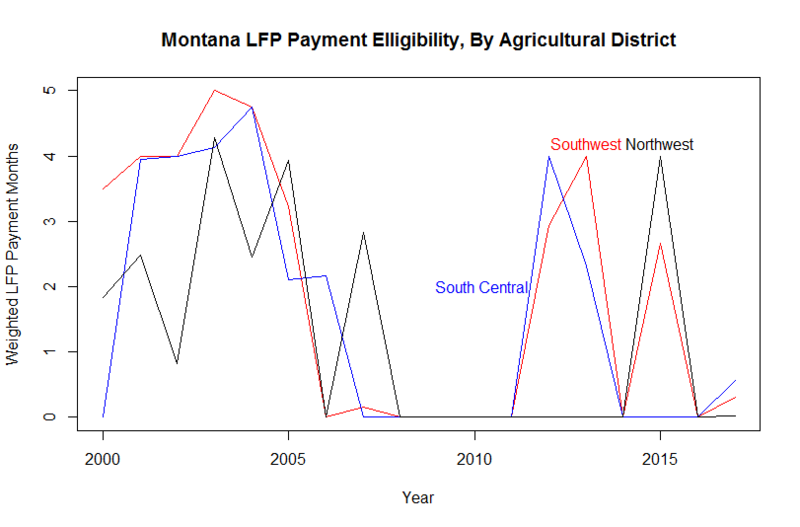 To start, the figure below shows a map of eligible payments for the Livestock Forage Program (LFP) so far in 2017, which is one indicator of the severity of the current drought. If you ranch in a county that is colored in the figure below, you can determine your payment amount by visiting your local FSA office. Payments under LFP are determined based on the Drought Monitor Index, which accounts for “climatic, hydrologic and soil conditions as well as reported impacts and observations from more than 350 contributors around the country.” It is clear that the main impacts of the 2017 drought primarily impact the northeastern portions of the state. The most recent map of the drought monitor index can be found below. While the drought has shrunk substantially over the last few months, it still lingers in the northeast. 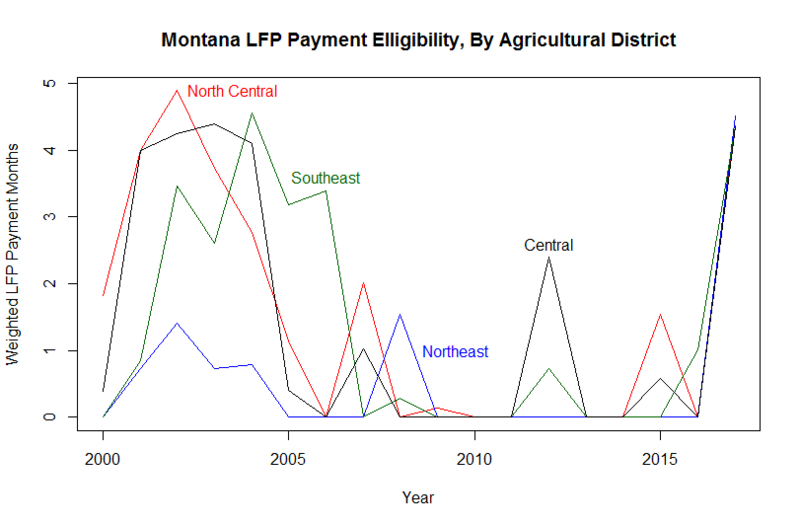 To place this recent drought in context, I computed the average payment eligibility made across the 7 agricultural districts (see below) within Montana in order to asses the severity and compare this severity to past droughts. The plot below begins with the agricultural districts most impacted by this drought, which lie in the east and northern parts of the state. As you can see, these districts are experiencing drought conditions that are worse than has been experienced in at least 10 years. To make matters worse, the drought is more widespread than in past years, as it has impacted nearly all of these districts severely. 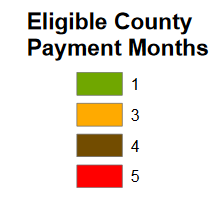 To illustrate, the average payment across these four districts is 4.40, where a given county hits a cap at 5 months. Additionally, these districts are closely clustered together in 2017 with the lowest at 4.35 and the highest at 4.51. 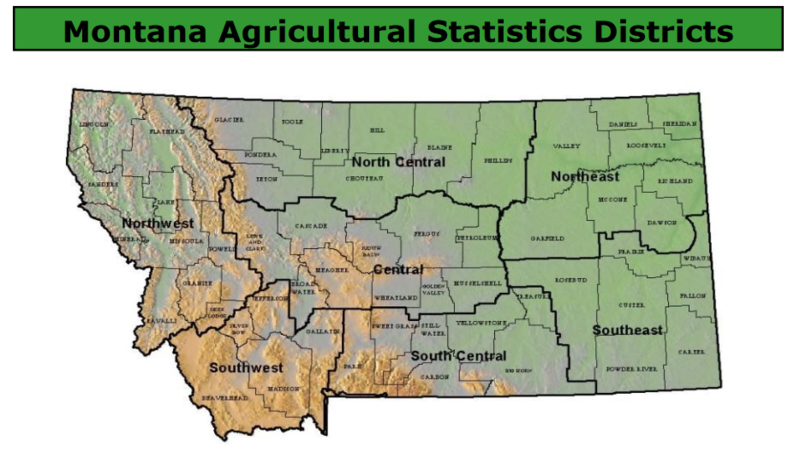 In contrast, there are also counties on the other side of the Great divide that have not been noticeably impacted by this drought. These districts have experienced recent droughts in 2012, 2013, and 2015, but did not experience much in 2017. 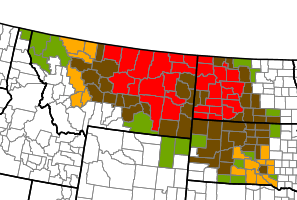 All districts in Montana have been impacted by a severe drought at some point over the last 5 years. So, the question then becomes, how can ranchers prepare for drought? Below are some strategies for dealing with drought in both preemptive and reactive ways. 1. Develop a drought plan. Droughts are inevitable and its a good idea to have a plan of attack before it happens. This takes the emotion out of these decisions and instead allows you to make those plans in a more objective way. Banks call this a ‘stress test’ where they look at whether they can continue to operate if the worst happens. 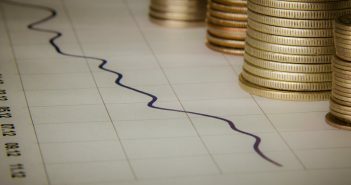 They manage their decisions so that they have adequate capital to manage bad times. A sustainable ranch operation can also develop plans under drought conditions, where finances and resources are stressed. Are you managing risk so that you can make your loan payments? 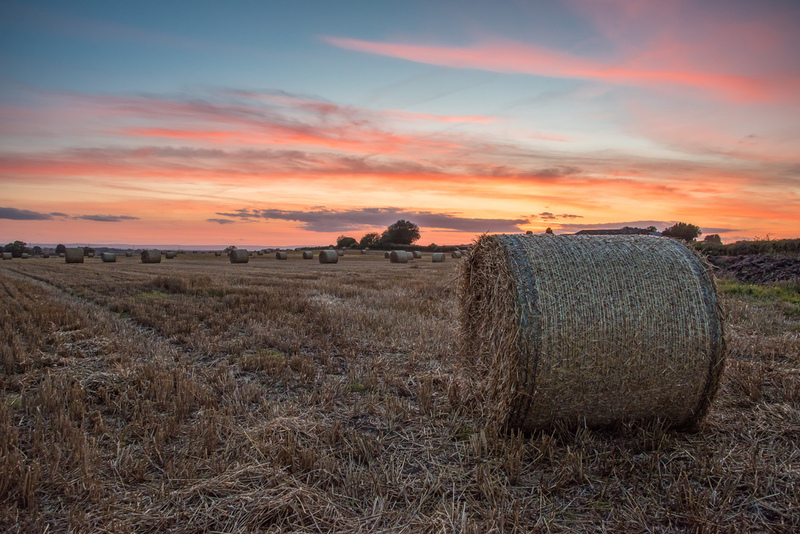 Will your range and hay supplies sustain your herd size? Does your stocking rate need to be adjusted? This strategy is nothing new to Montana. When you are low on grass or hay, lower your herd size. This is more of a reactive policy, but allows you to maintain healthy pastures for future operation. The downside of such a strategy is that it does take some time to build up your inventory when good weather returns. Additionally, you are likely to experience a regional discount when selling if all your neighbors are doing the same thing. I recently saw a couple of range ecologists who published a paper that talked about using weather and range conditions in early spring to make inventory decisions for late summer and fall. The advantage to this is that it allows you to sell in the market before the majority of the market (at least in Montana) is selling and sell before local prices fall. I’ve heard range scientists at MSU talk about this and think if you are able to predict your range conditions in early spring, it could help managing drought conditions in a proactive manner. Again, these stocking rules should be established before a drought occurs so that you can act in an optimal way. 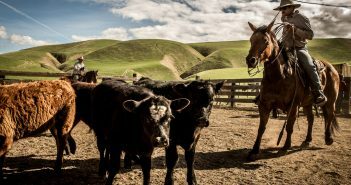 There are a few main programs developed to assist ranchers in times of drought and each of them are decoupled from production, meaning it doesn’t matter whether you’ve actually experienced a loss or not. First, there is an insurance product (Pasture, Rangeland, and Forage Insurance) that can be purchased to insure against lower than normal rainfall. Second, there is a standing disaster program that pays when your county experiences a drought (Livestock Forage Protection). For more information on these programs (and others), see our website for more information. Are there other strategies that you use? Let me know. This conversation will continue in futures posts as well as during the upcoming Annual Fall Conference on November 3rd.